I hate wearing jeans in the summer. Hate it! Jeans are just so uncomfortable when it’s hot out. But I’m not a big fan of shorts either – I wear all my clothes to the knee and I don’t love how long shorts look on me. So I like to wear casual skirts and dresses in the summer. 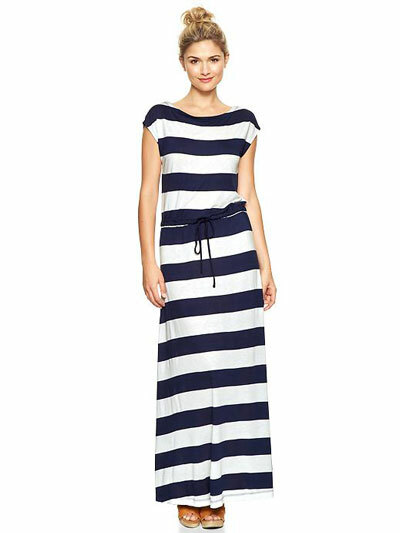 I saw this dress from The Gap and just loved it: cute, casual, and it even has sleeves, unlike most maxi dresses (why are they all sleeveless? I don’t get it). But it’s $75, which is a little pricey, and I could tell from the photo that the gathered waistline would hit very low on me – I’ve tried on a few dresses with low waistlines this season and they look pretty terrible (maybe better for taller gals?). Plus in the reviews people complained that the fabric was very thin, which means it wouldn’t hide my muffin top very well. So I figured out how to make my own. Mine cost $17, is made from a nice medium weight interlock knit that’s not even see-through, and I could customize the waistline to right where I wanted it. Even better? 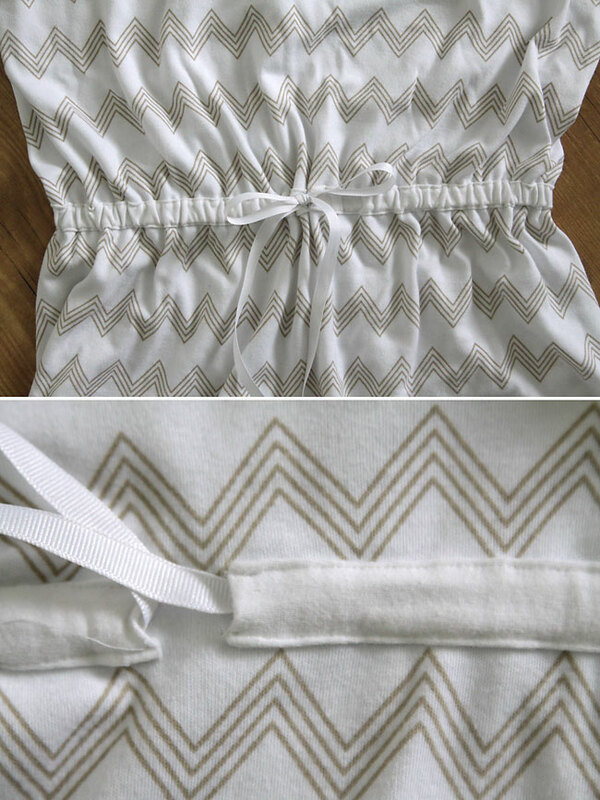 It’s a pretty easy hack of my free Easy Tee pattern. I didn’t take photos of every step since this was a bit of an experiment, so I’ve made some really awesome illustrations to try to explain what I did. I started with 2 yards of knit fabric, which is 60 inches wide (I used this fabric from Girl Charlee and I absolutely love it! I have a terrible time finding white knits that are not see through, and this one is perfect!). I cut around the neckline, shoulder, and sleeve of the easy tee pattern, then under the armpit I just gradually widened it out and took it down to maxi dress length. I’m 5’3″ and had at least 10-12 extra inches of fabric at the bottom that I didn’t use. However, if you’re tall you’ll probably want to cut the dress all the way to the end of your yardage. Cut one piece from the left side, then flip it over and cut an identical piece from the right side (just lower the neckline slightly so it can be the front of your dress). 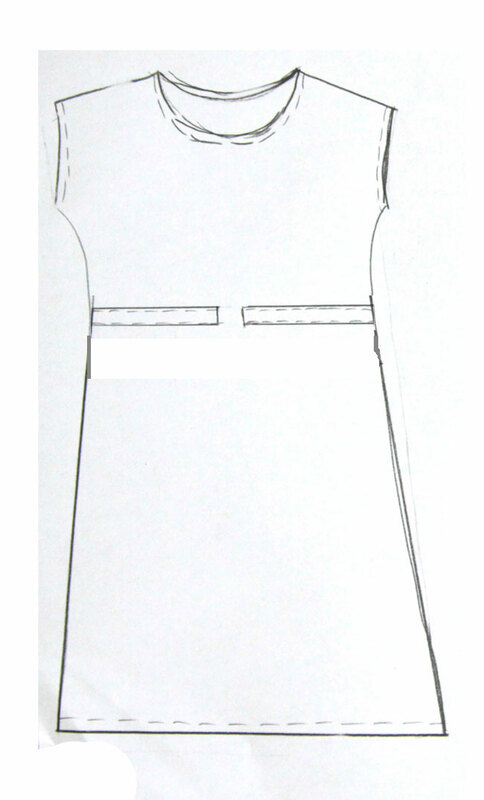 As you can see in the illustration above, once you have the front and back pieces sewn together you need to finish the sleeves and neckline (see the original tutorial for instructions), and then add a casing at your waist. The casing will hold elastic that will cinch the dress in at the waist. 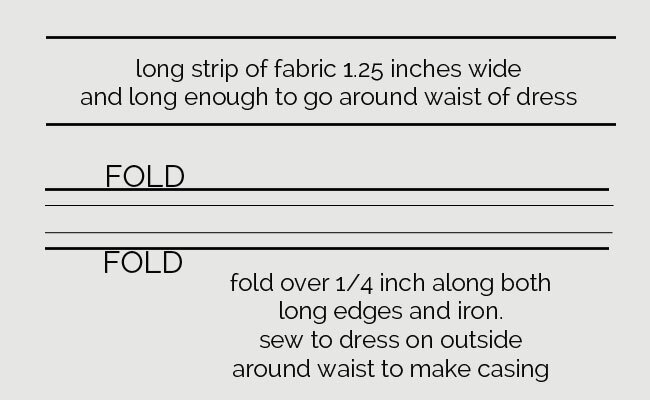 To make a casing, cut a long strip of knit (either from the bottom of your yardage or from a different piece of knit), that’s 1.25 inches wide and long enough to go all the way around the dress at the waistline. Sewing on the casing is honestly the hardest part of this whole dress, and it’s not that difficult – it just takes a little time. You can see in the close-up photo that my stitching is a little wonky here, but when the elastic cinches it up you can’t tell. (Be sure to use a long stitch length when sewing on knits.) I cut 1/2 inch elastic just shorter than my waist measurement, then sewed ribbon to each end of the elastic, and threaded it through. That way all the elastic hides inside the casing, and I can use the ribbon to tie a bow in front. Then you just hem the dress and it’s done! Easy, comfortable, and much cooler than jeans (and 60 bucks cheaper than the Gap’s version!). AND my muffin top is nicely hidden, which makes all of us happy. « DIY photo calendar gift idea + a GIVEAWAY! YES!!! A dress for the ‘rest of us’! Thank you so much! I’m going to start looking for some knit. Now I know what to do with the stash of knit fabric I couldn’t figure out what to do with and was afraid to sew with it. I love this dress….I am 5″3-1/2 (used to be 5″4-3/4!) ……and I have huge ‘bat wings’. 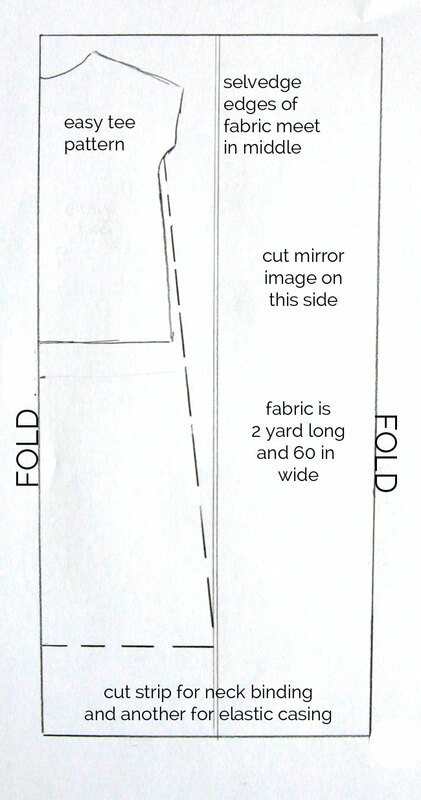 I am going to try this pattern but I think I may try to do a dolman-type sleeve – to cover my arms. I love the simplicity – I love how comfy it looks – and I love that the pattern could easily be adjusted/adapted for lounge-wear or evening wear. Thank you so much! Very cute! I might have to pull out the old sewing machine for this! I love this! I also have an aversion to shorts, and prefer knee length dresses and skirts in the summer. 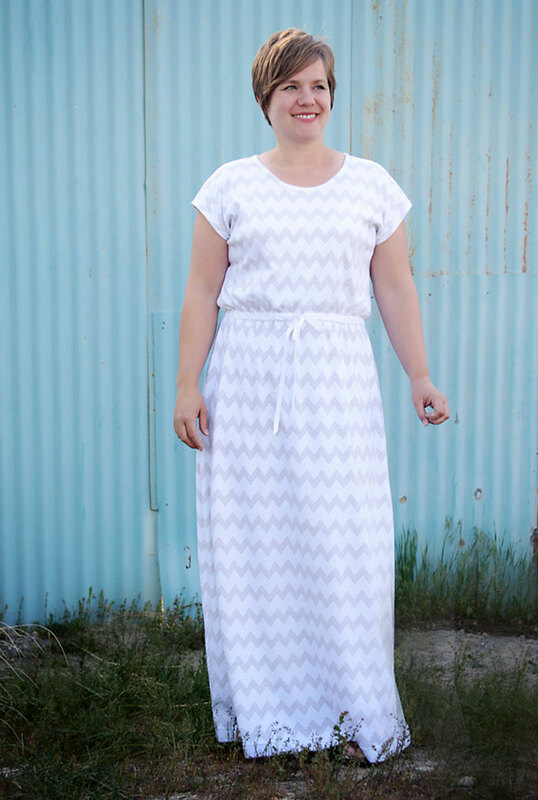 If I wasn’t having a baby this summer, I would absolutely make this dress very soon, but it is definitely on my sewing list for next year, along with the other easy tee versions! You know, if you made the waistline high this would probably work pretty well as a maternity dress! Congrats on the upcoming baby and good luck! I like having the sleeve, and the muffin top eraser. Looks comfy! Super cute! I love how easy this is. Thanks for the tutorial, Autumn! Thanks so much, Crystal! It was fun to go from start to finish in just a few hours. Thank you! Yes! Sheesh, why no sleeves? Ever? I mean, I have cardigans, but it’s not as easy as it could be. Very excited to give this a shot! I hate always having to wear something over or under sleeveless dresses – what a hassle! I have a pile of knit just waiting for this! Thanks! 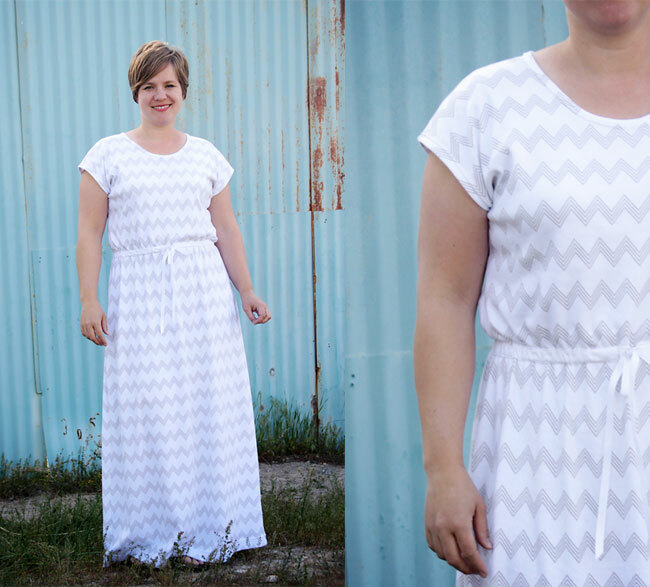 Finally, a maxi dress with sleeves! I love the idea of creating it to fit your own body style. Thanks for sharing! I’m definitely adding this to my list of things to make. And I love the fabric you chose! Sounds like we’re twins except I’ve got a whole inch on you! 🙂 I hope it works out for you! I really like this pattern, as I don’t like shorts, either. I’m 74 and short. I need patterns like this! Love the dress idea. I love your site because you are a “normal” size girl as most of us are. Thanks for offer the great T pattern and showing us so many options to use it. Wow I just love this. I am seeing it in a French terry…think swim suit cover up nice enough to wear out for lunch. I am definitely going to have to make more than one…I go out to lunch a lot! Thank you so much for something beautiful and yet doable without spending a lot of cash or all weekend creating. I love this dress. Making one in terry is a great idea! Maybe knee length? Such a cute dress! I have the perfect knit just waiting for a project like this. And the ribbon sewn to the ends of the elastic – genius!!! So much better than just ribbon threaded through. I hate having to constantly adjust it and may go back to update some things I’ve made in the past . Thanks, Julie! I hope your dress turns out great – send me a picture of it once you make it! Thanks for the pattern and its even more easy as I teach and do alot of sewing. Could you make this dress out of lightweight cotton maybe ? I think you could – I’ve actually been meaning to try it. The only thing you’d have to be careful about is that if you use a material that doesn’t stretch you’ll need it to be loose enough to take on and off over your head. I think mine is roomy enough on me that it would work even without stretch – but I haven’t actually tried it yet so I can’t say for sure! I love this! I am going to try to make it but I’m nervous about the neckline as I”m a beginner and I’ve never sewn a neckline before. Do you have any tips for doing that part? I checked out the easy tee tutorial but don’t understand how to make it stand up like that. 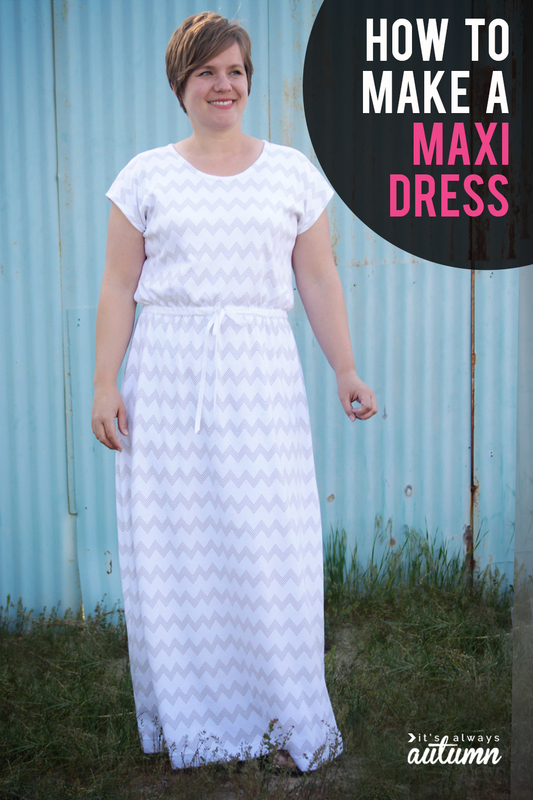 Thanks for sharing your maxi dress post. Your dress looks great! And I have the exact sentiment as you, why are most of the maxi dresses out there with spaghetti straps! I have bought a long maxi dress which I need to cut a few inches off the hem and have actually make wider straps for the dress. Now if only I could find one long enough to cut at the hem to make decent sleeves with…haha. Hi! This may sound like a silly question, but I’m new to sewing apparel….When I sew the shoulder and sides together, the dress is inside out correct? But when I sew the casing on, is the dress turned right side out? Sorry…just a little confused! Thank you!! Not a silly question – and you’re absolutely right! Most seams are sewn with the garment inside out, but we add the casing on the outside of the dress, so yes, it’s right side out then. This dress is cute! Have you considered to do a version of a Sonnet James dress? I love this! With some modifications, I made it into a maternity dress to wear for a wedding I’m in this month. The cut of the sleeves and the collar are beautifully modest, which is something I have trouble finding in maternity clothes. Thank you for sharing your patterns! Hi there, thank you so much for posting this dress. I’ve done a lot of sewing, but always with a pattern, and I hesitate to mess with a pre-made pattern to size it to me, don’t know why I have that hang-up! I also wear sleeves & clothes to my knee, so thank you for drafting your pattern to have a higher neckline than most! I have a question though, I wear a M or L, depending on the manufacturer, would you be willing to share the finished measurements on your dress? (bust, shoulders, etc.) That way I’ll know if your size L might also be my size L! :O) I’m 5’2″ and about 140 lbs (no secrets here!) for reference. Thanks so much!! I live the look of this dress. I hope I can make this. I have the muffin top also. Thanks for sharing. I know I’m late to the party, but this pattern is AWESOME! I live out in the boonies, so maxi dresses are just hitting big where I live. 🙂 I love this and plan to use the pattern, though I might make some changes to suit my style/tastes. Or I might not put in the casing, because I’m lazy like that. Wow thank you for this!! I am excited to try it. I love maxi dresses and this looks so good! Oh my heck! I haven’t looked at crafty blogs forever, but this is too much fun. I need to go to bed! Since this is an older post, the fabric link no longer works. I am new to buying this type of fabric. How do I find fabric like this? Thanks! and wear on any occasions. Nursing Mama here. I’m having the hardest time finding dresses to to wear to church that I can nurse in. Would it totally ruin the dress if I sewed a Henley placket into the front to make it breastfeeding friendly? do I need to adjust the size of the neckline? Thanks! Thanks so much for this tutorial! Very helpful. I made a pretty aqua maxi dress for my kid sister and she loves it!